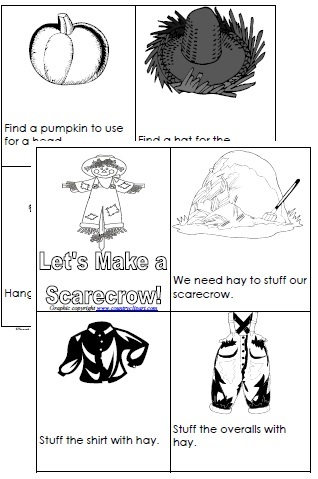 Scarecrow Theme/Unit - great ideas and more. Fall is in the air and this year more than ever, I am seeing scarecrows everywhere. I thought scarecrows would be a great mini unit and wanted to share some of my ideas with you. Welcome to Teaching Heart's Scarecrow page. I hope you find something you can use with your students! Super Easy and No Baking  Microwave Only! Melt the chips together in the microwave (about 2 min). Add the box of fiber one and stir. Quickly place a large spoonful onto wax paper or into muffin cups. 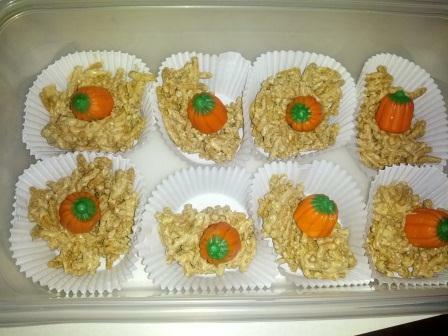 Let set for about an hour and you have some yummy Haystacks to enjoy!!! 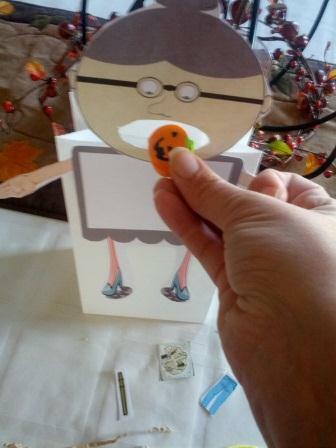 Add a Candy Corn Pumpkin for more fun! My Favorite Books For This Unit! The Adventures of Top Hat Crow - Such a cute story about a crow who just wants to do what he wants. 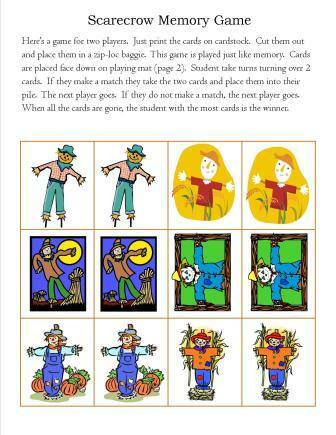 The illustrations are adorable and the story goes perfectly with a Scarecrow Unit. It is written by a former teacher and as a result the text tells a story as well as teaches a lesson. 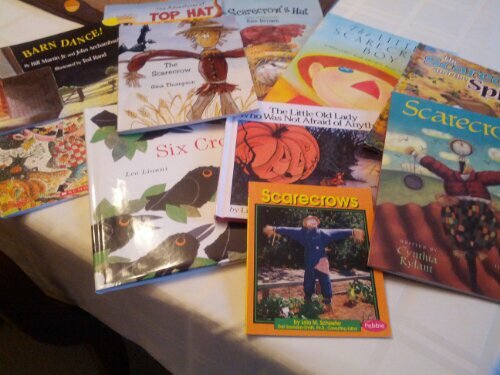 I am always looking for books with crows as the main character when discussing scarecrows with students. This book is about a little crow who really should have listened to his mommy and daddy. When he doesnt listen he ends up in a great deal of trouble. The story ends happily but the crow learns that mommy and daddy make rules for their children to keep their children safe. Perfect read-aloud for PreK, Kindergarten, and First Grade! 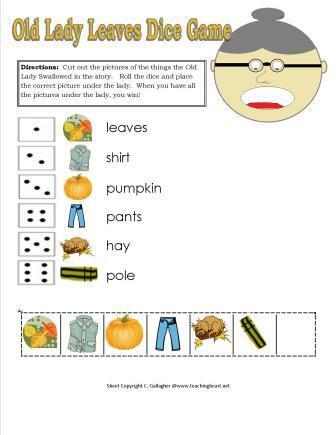 A perfect story to ready during a scarecrow unit!!! Read till the end and you will know why! Not to mention KIDS love this story.... I do too! 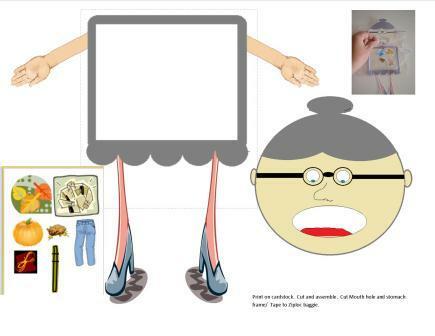 The fun board above was created by using the printables from this packet (I used velcro so the students can put the pictures on the board to match the story) and the free Old Lady Printables found at Making Learning Fun! Talk about the words. Write them in sentences. During the start of the story the little old lady runs into a pair of shoes. What is unusual about these shoes? Would you be scared if a pair of shoes was following you? 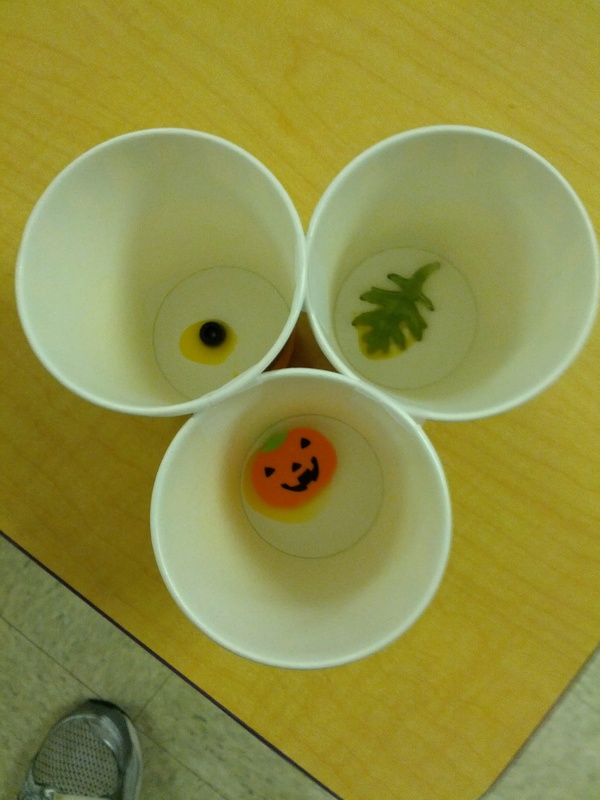 After the pumpkin says, "Boo, Boo!" 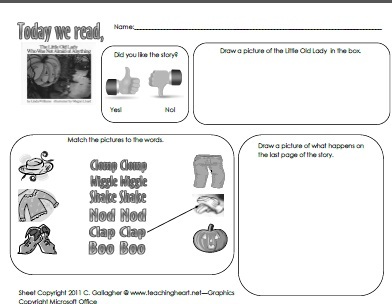 in the story ask the students to tell you what they tink will happen on the next page? On the thirs to last page the little old lady whispers something to all the objects. What do you think her idea was? What would be your idea? On the next page, the lady looks out the window. Before turning the page ask the students to make predictions on what she might see. When the pumpkin's head shouted, "Boo, Boo!" the little old lady ran off. Have children brainstorm other situations that are made more frightening with sounds. Then play the following Halloween soundtrack and have children guess harmless ways the sounds could of been made. `Readers Theater to Match this! 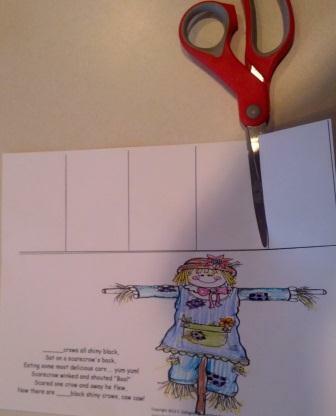 see the packet below for more printables to match this story! Activities to Match There Was an Old Lady Who Swallowed Some Leaves! You do know she swallows all that stuff to make a scarecrow? So this book is perfect for the scarecrow theme! 1.) There Was An Old Lady Who Swallowed Some LeavesBaggie Patterns. 2.) There Was An Old Lady Who Swallowed Some LeavesApron Patterns. 6.) 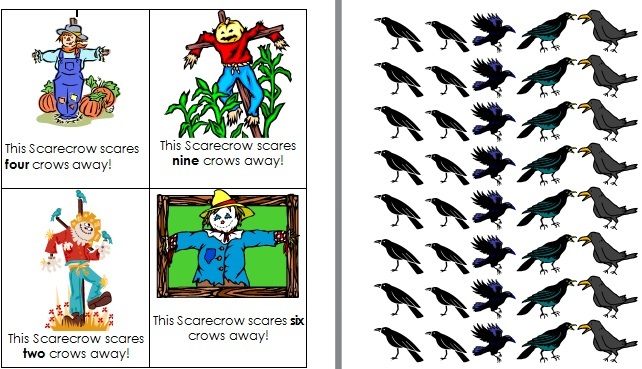 Scarecrow Numbers Pocket Chart or Take to Your Seat Center> Students match the crows to the sentence. Crow Manipulatives Included. 7.) 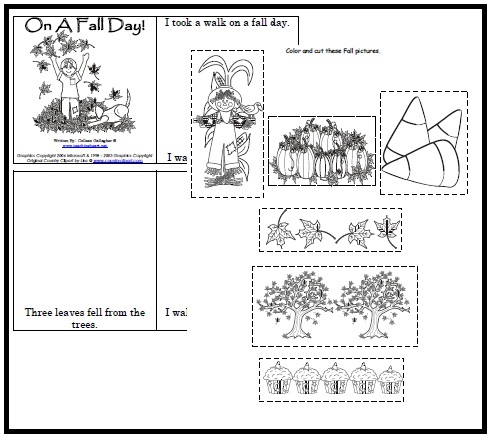 Fall Day Mini BookStudents color and cut. Then place pictures on correct page. The Little Old LAdy Who Was Not Afraid of Anything is another great read for this unit since at the end of the story all the parts come together to form a scvarecrow. 8.) The Little Old Lady That Was Not Afraid of AnythingBook Review Form. 9.) The Little Old Lady Who Was Not Afraid of Anything Pocket Chart Pieces. 11.) 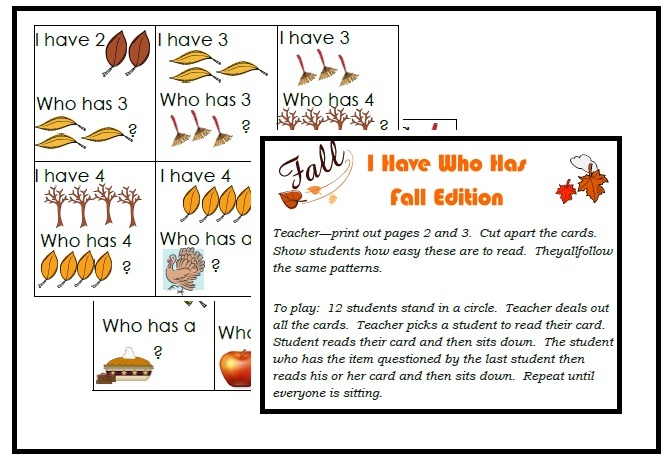 Fall Edition of I Have Who Has for 12 students. Directions Included. 13. 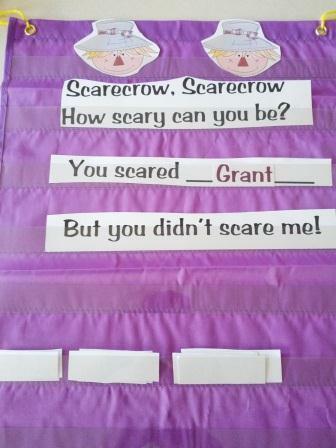 )ScarecrowRoll, Say, Keep lowercase letter sounds game. Direction Included! Story Props can be used in pocket chart. 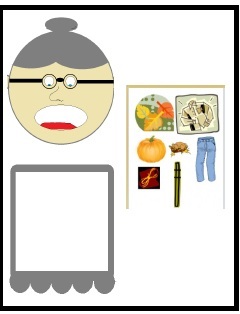 Laminate and put magnets on them and retell on cookie sheet. Match the props to the words. 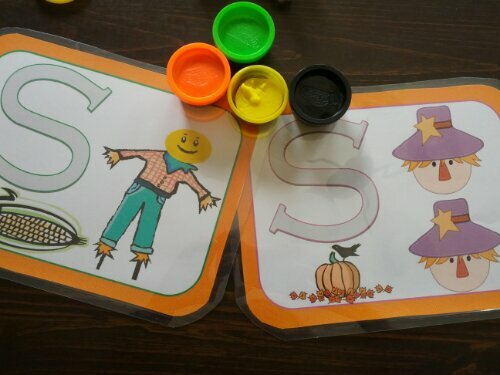 Cut and laminate pieces for use in your pocket chart. 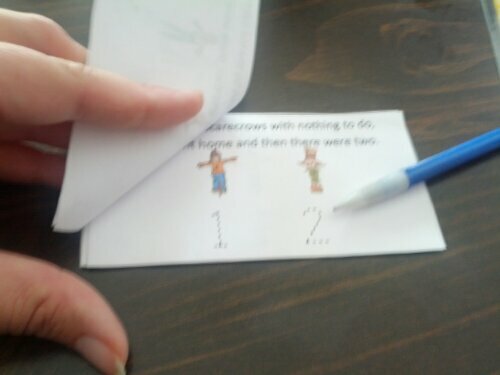 Students finish the sentence by adding the picture to retell the story. Also included is a cut and paste sheet for independent review. 16.) 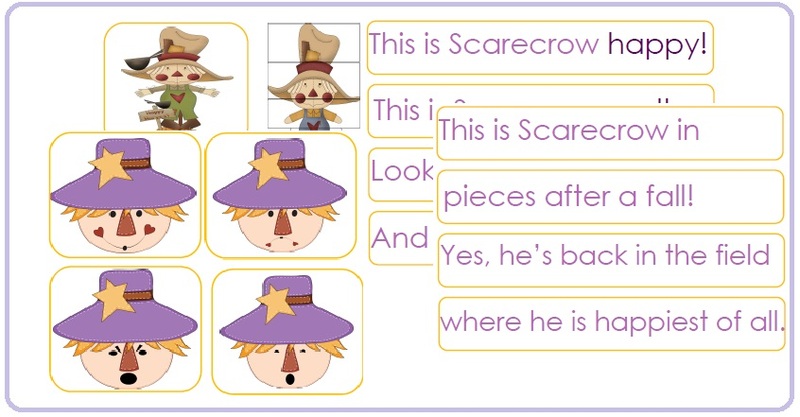 Scarecrow Emotions Pocket Chart Pieces. 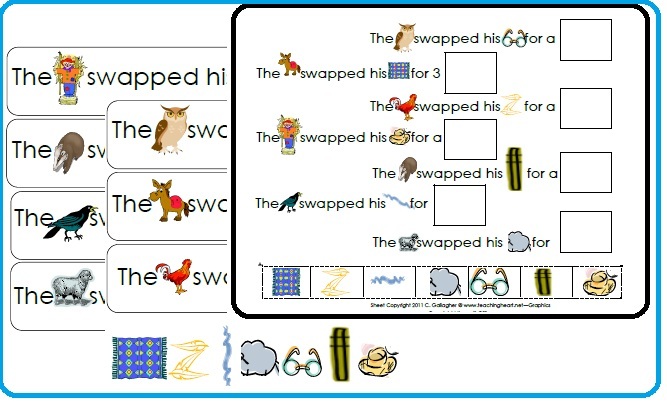 Students the correct picture to given sentences. 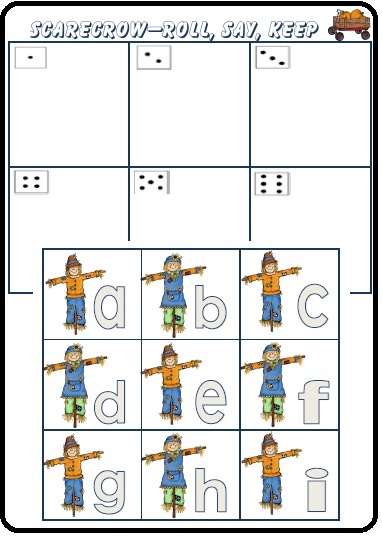 Before allowing the children to play with partners, I plan to teach this to pre-k whole class by first using a large dice. 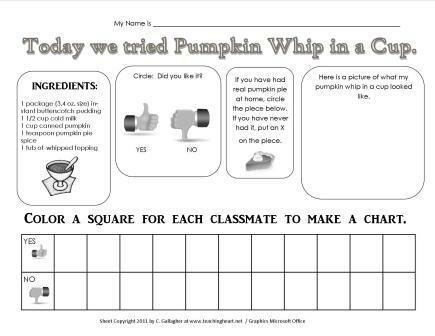 As a class I will pick a student to roll the dice and we will add to the scarecrow until we have rolled our complete scarecrow head and pumpkin. Then after they have gotten the idea of how to play, they can then play with a partner. It's here - Click to learn more! You can get all of these files now in an instant download. Click here to visit our store and get printing! Files are all PDF and come zipped. The first free printable in the set is a little counting book. Student traces the numbers in the story! 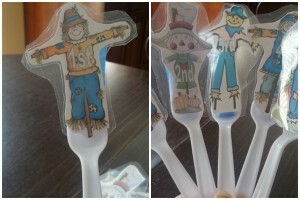 You will also find props to make the five little scarecrows. Arent they cute? I just laminated them and hot glued them to a plastic utensil. 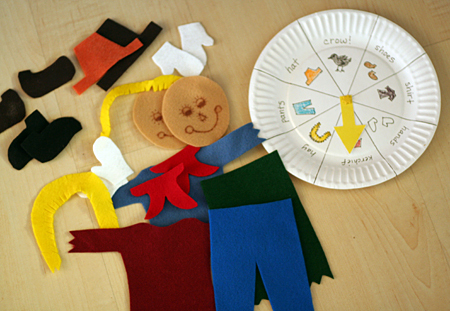 Now I have little puppets I can use to retell the story with! You will also find a few more pages of goodies to use with the Five Little Scarecrow Poems. I hope you will able to use this with your children or students! 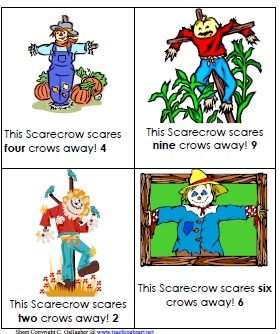 Five Scarecrows 8 Pages of Printables  Click to download PDF! More Fun With The Scarecrow's Hat!!! 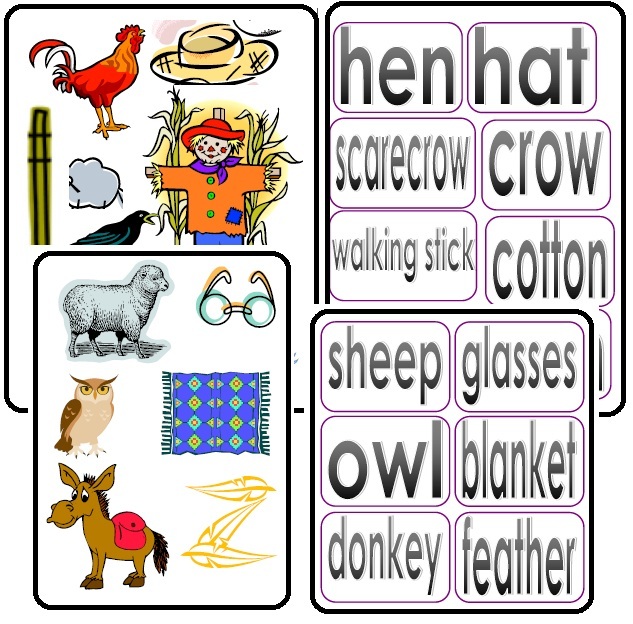 But why does a chicken want a scarecrows hat? 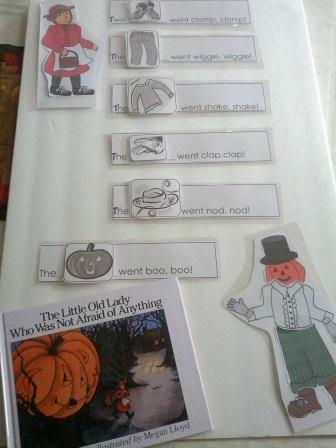 Shares this great idea to use with the book! Read more at their website!!! You can have your students complete this sheet by reading it on their own (1-3) or you may read it to your students and have them follow your verbal instructions. 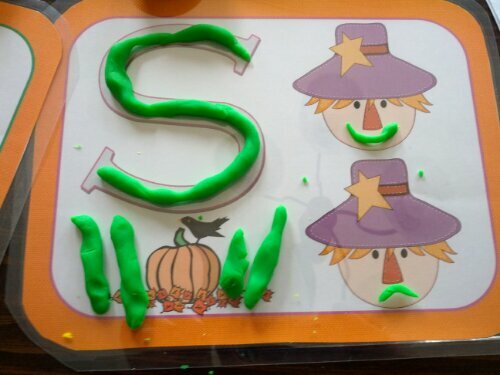 Play-Dough Scarecrow Fun Mats! - Click to Download! Have some fun with the Crows too!!! 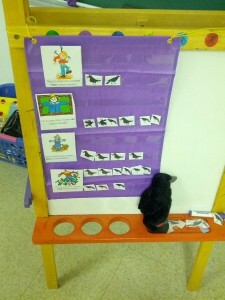 I have a crow plush that loves to land on students who are quiet scarecrows! The students stand tall while the crow flies around. He lands on the students and peck a little at them. He will often tell them that they taste like sweet corn! My crow is seen below. He has a button you push and it sounds very crow like when he caws! I tweeked an idea that I saw at Mrs. Lee's Kindergarten (it's filled with super fun scarecrow themed ideas)! Eating some most delicious corn ... yum yum! Scarecrow winked and shouted "Boo!" Now there are ____black shiny crows, caw caw! I created a craft type coloring sheet. Print it front to pack. 1.) 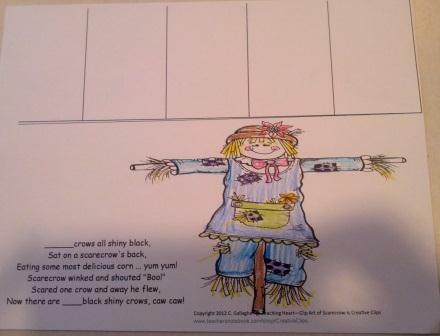 Have the students color the scarecrow. 2.) Cut the lines above. 3.) Fold the crows over so they are now covering your scarecrow. 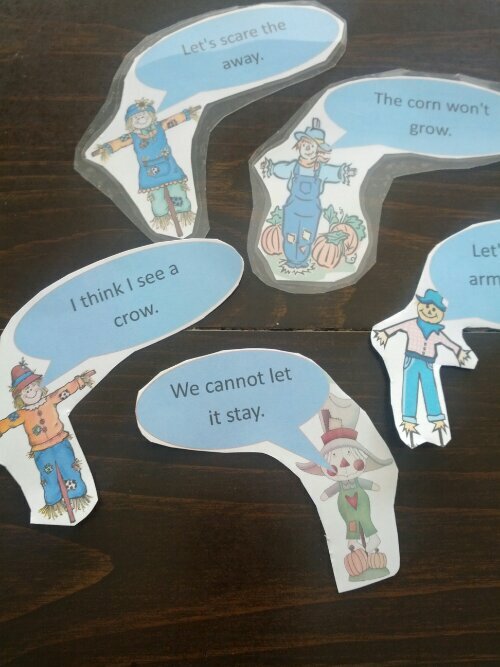 Now you students can act out the poem together. 4.) 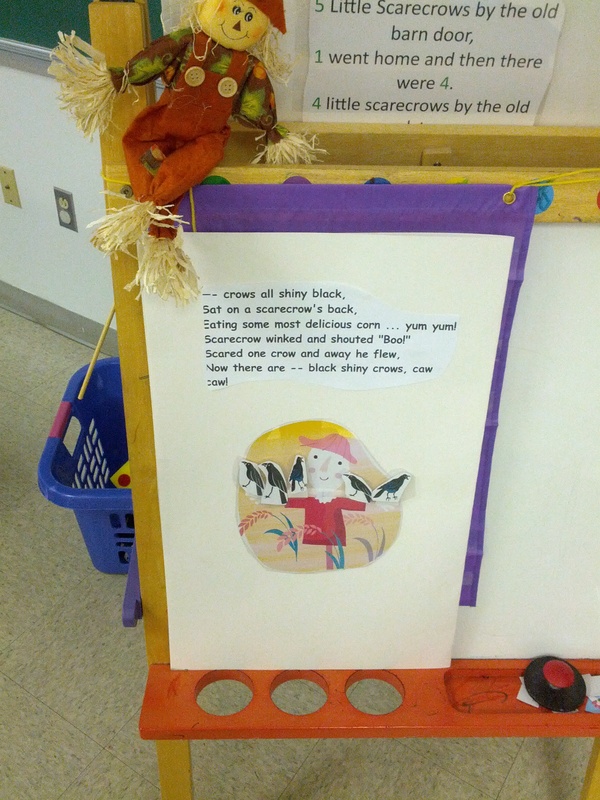 Now students can read the poem and manipulate the crows as they subtract a crow until there are none! A hungry crow came to visit the students today. The happy students offered the crow some hay. But the crow flew away! 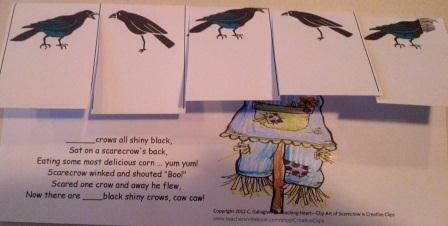 They knew that they must color the crow something sweet. So, they each quickly made the crow a treat. Now there are  black shiny crows, caw caw! 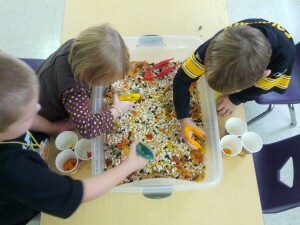 We hunted for crows (Black beads), Pumpkins, and leaves in the fall sensory tub. The sorting sheet is found here. 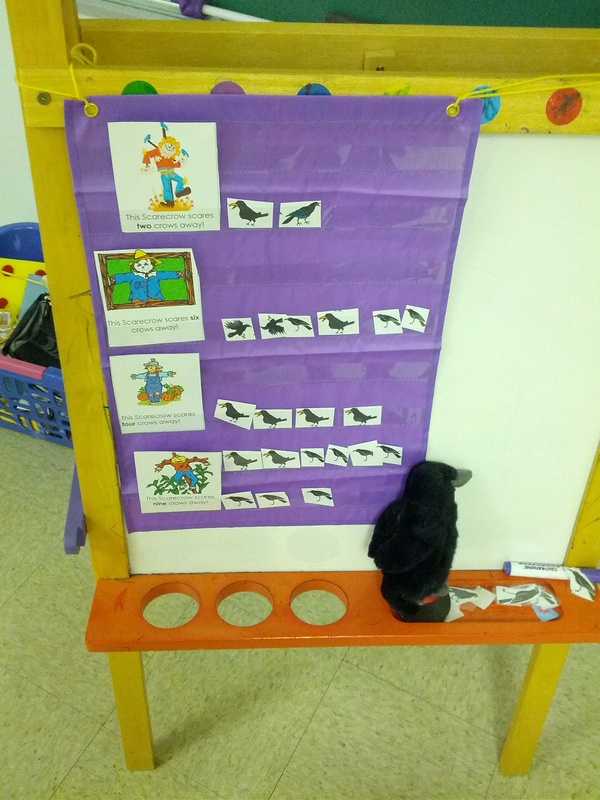 We also had lots of fun putting the correct number of crows in the pocket chart. 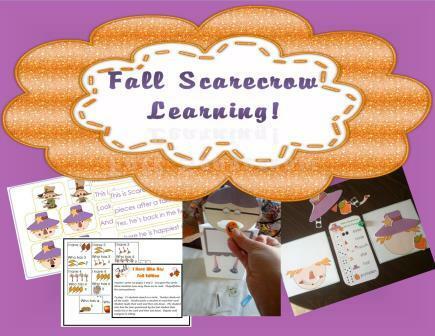 This printable comes from the Scarcrow Packet  click here. 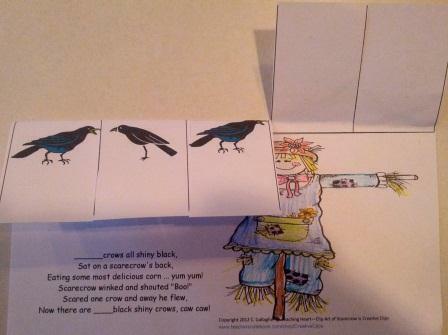 Help the crow get to the scarecrow dice game! 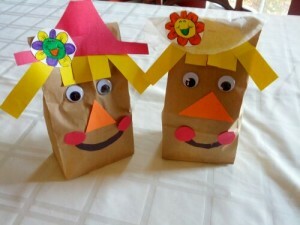 Simple Boy and Girl Paper Bag Scarecrows Craft! All you do is glue on the face parts and hair. 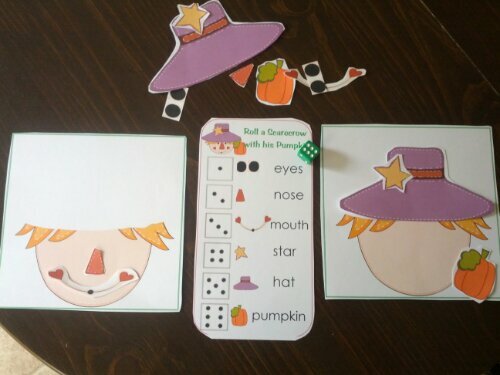 I used a coffer filter for the girls hat and construction paper for the boys hat. Stuff the brown lunch bag with paper and staple shut. Aren't they a cute little couple? EASY Paper Plate Scarecrow Puppet! Free To Print from other sites! PDF with great ideas. 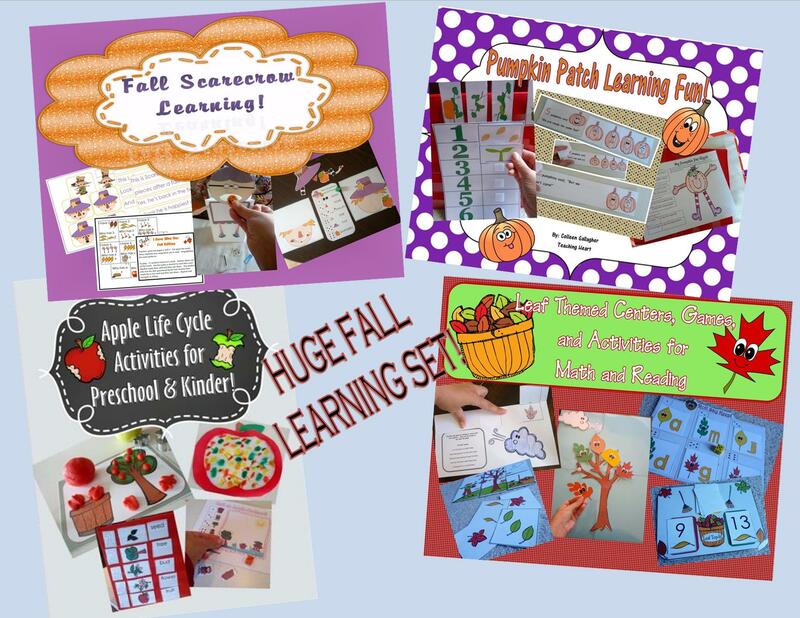 Last pages have printables! When they come walking 'round. Scarecrow standing in the field On a bright and sunny day, Don't forget to do your job. Scare the hungry crows away! And a shirt that's torn. But you can't scare me! No, you can't scare me! The first one said, "Go away, crows!" The second one said, "I am very small,"
The third one said, "I am standing tall." The fourth one said, "On my head I wear a hat." The fifth one said, By me feet runs a cat." 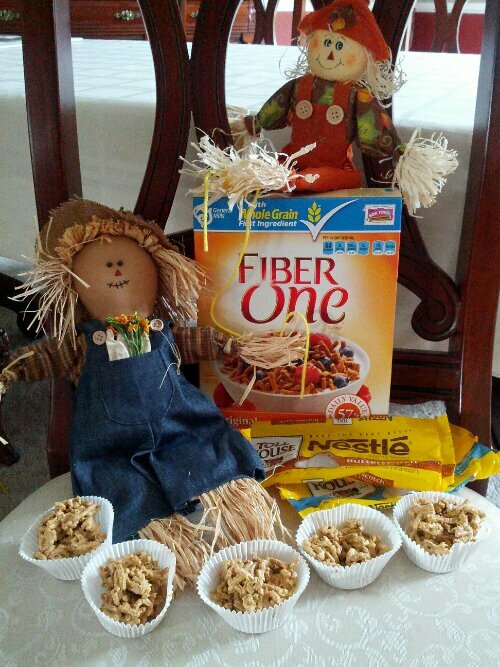 Sensory- Place on a table the different articles of clothing and types of filling used to create a scarecrow. 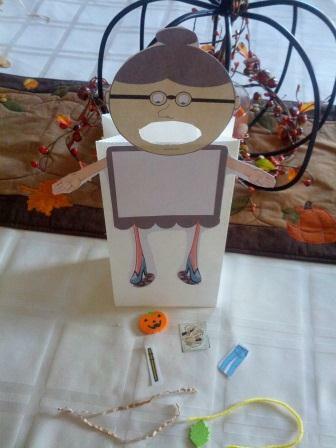 Have the children feel the raffia, crumpled newspaper, and stuffing used to make a scarecrow. 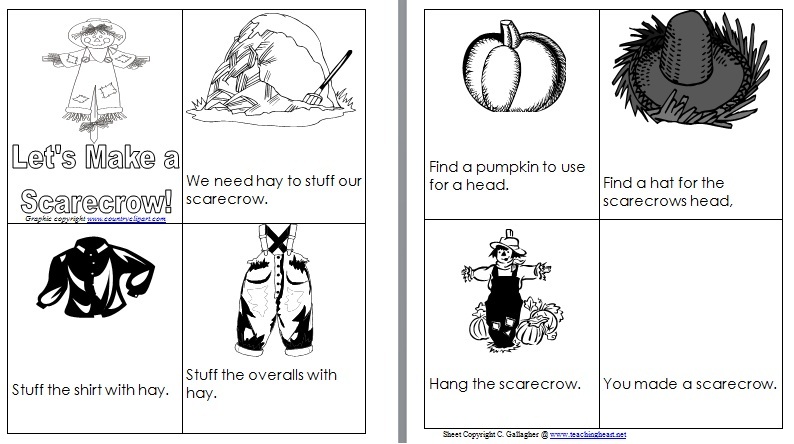 Ask the children what noises if any does each type of filling for the scarecrow make. Ask how does each item feel. 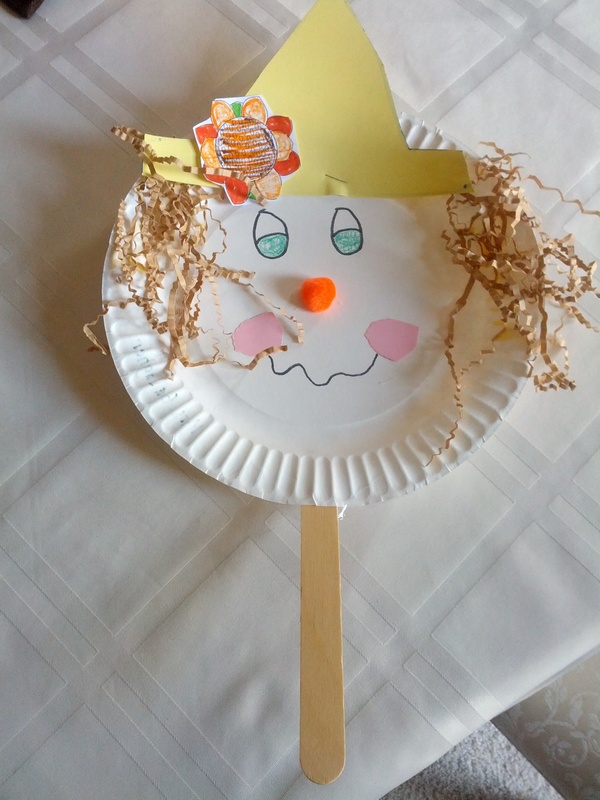 After this discussion, have children help you make your own scarecrow using the objects on the table along with a hat for your scarecrow's head. A Huge High Five to Kim Koehler at kckoehler12@yahoo.com for sharing the following glyphs pictures, and printables to match! 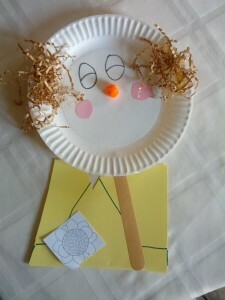 Here is the pic of the scarecrow glyph we do. I use fabric scraps for the patches and a cut up raffia bow for the hay on the arms and legs. I also will add the key too! 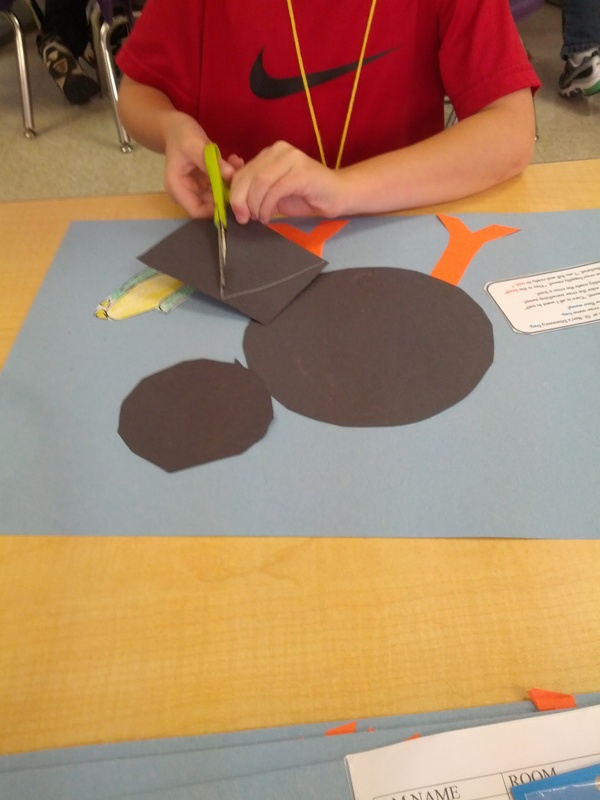 It takes my third graders usually two days to complete it. I hot glue on the straw and buttons for them. I usually have them trace and cut out the pieces on one day and then glue them together on the next day. 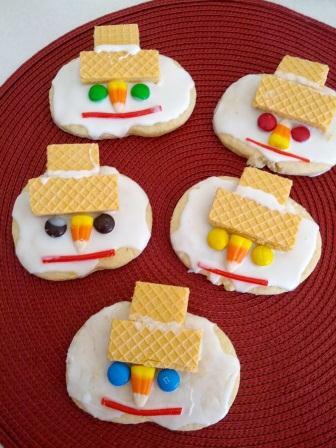 Skip to My Lou Shares Super Cute Cookies! 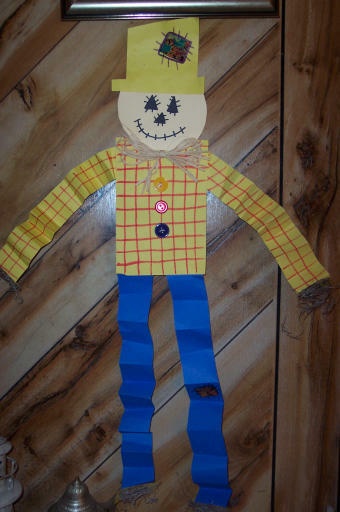 See our Scarecrow Pinboard for even more fun!